42 Inch Plasma LED LCD - 1/4 Plywood Light Duty ATA Recessed Case by Roadie Products, Inc. at IGWT. Hurry! Limited time offer. Offer valid only while supplies last. Please make sure you measure your Plasma including stands, clamps, brackets, and compare to the inside dimensions of this case before purchasing. Please make sure you measure your Plasma including stands, clamps, brackets, and compare to the inside dimensions of this case before purchasing. These large plasma cases are very expensive to ship. Returning this case will not be cost effective to you. The plasma case is constructed of 1/4 plywood with black PVC laminate surrounded in aluminum extrusion and permanently machine split riveted together. It is then finished with 4 high quality spring loaded recessed catches and a 2 strong recessed spring loaded handles (one each end). All hardware is plated for protection against corrosion. The interior is completely carpet lined for protection of your Plasma. End blocking foam strips and foam sheet are also included for custom modifying the interior to fit your specific TV. 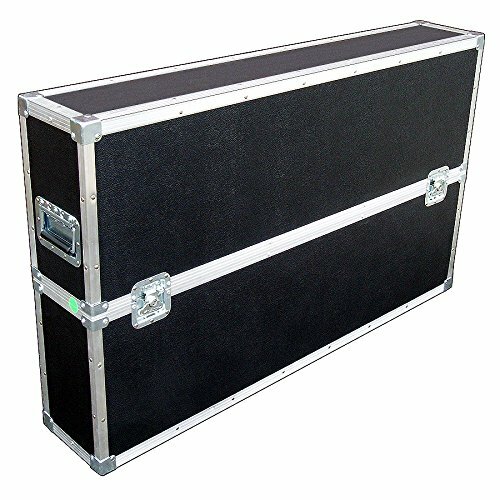 These cases are only 1/4 light duty construction and not recommended for shipping or airlines.